​Compost worms (red wigglers or Eisenia fetida) are not the same as earthworms you typically find outdoors after a rainstorm. You can buy them from someone in your local area or from me. Contact me with any questions. One-pound orders are $29.98 (bed run*), two-pound orders are $59.96 (bed run*), which includes shipping (within the continental US). Minimum order is 1 pound. All orders are shipped USPS Priority Mail with tracking numbers (2-3 days). I typically ship on Mondays or Tuesdays. Contact me with questions. I have worms and bins available for pick-up, if you're in the greater Portland, Maine area. Worms for pickup are $20 per pound (bed run*). Worm Bins are $20 each. Minimum order is 1 pound. Pay at pick-up. Contact me for local orders. We can coordinate on a location and time. $35 SPECIAL: One pound of worms and a worm bin! My worms are shipped bed run, which means that you receive worms (all ages plus cocoons) along with worm compost and bedding. Worms shipped this way are quite happy and are most successful at colonizing a new bin. Note: you will receive a pound of worms along with the vermicompost (soil) they need to survive (typically over 2 pounds total). This is not what you would receive from a bait shop. 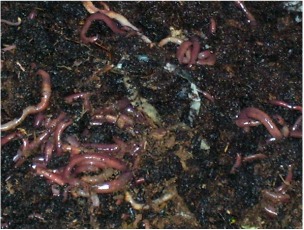 Worms are shipped in as dense a population as naturally occurs in an active worm bin. This ensures that they will be healthy when they arrive. Bedrun contains worms in as dense a population as will be healthy. Depending on the mixture of worms in the scoop (adults, juveniles, and cocoons) the actual number varies greatly. Typically those orders with fewer adults will have more cocoons. The most important thing to remember is that it is vital to receive your worms in good health so that they can colonize your bin. Worm populations typically double every 10-12 weeks, so you want a healthy population to start breeding right away. If you are on the other side of the country, I encourage you to buy from a local grower. Web sites are available that list worm suppliers (City Farmer) to help you find a vendor near you. Frankly, the longer worms spend in transit, the greater risk of loss of live worms. I do not ship worm bins. They are for pick up only. 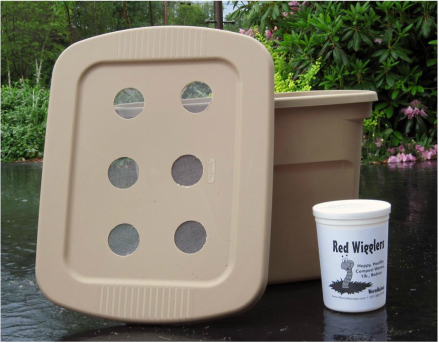 Contact me to purchase a ready-made worm bin or starter bin. 18-20 gallon size bin without worms is $20. 18-20 gallon size bin with 1 pound of worms is $35. Save $5! 18-20 gallon size bin with 2 pounds of worms is $55. Save $5! Would you like me to set your bin up, so it's ready to go as soon as you pick it up? (no assembly required!) Let me know. Set-up fee is $15. Garden fork included; just add food scraps! Want to make your own bin? Click here for instructions. A gift certificate is a great option if you're not sure if the recipient is ready to start vermicomposting immediately. You can determine the amount for the gift certificate, and the recipient can redeem it any time in the next 12 months. I'm collecting donations to offset the annual cost of maintaining the website. If you find the site useful, consider a donation to help keep these pages available and free of advertising! Any amount is welcome and appreciated. THANK YOU!